Glenn Corbett, a professor of fire science at John Jay College in New York, said: "Very often when you're confronted with something like this, there's not much you can do." 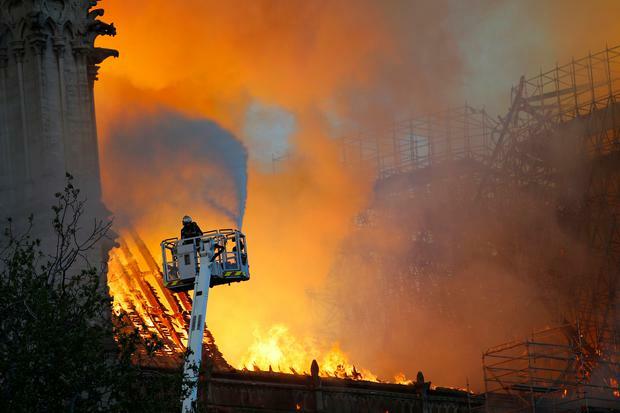 Fire hoses looked overmatched as flames raged across the cathedral's wooden roof and burned brightly for hours. The fire toppled a 300ft spire and launched cricket ball-sized embers into the air. US fire administrator G Keith Bryant said some of the factors that made Notre Dame a must-see for visitors to Paris - its age, sweeping size and French Gothic design, featuring masonry walls and tree trunk-sized wooden beams - also made it a tinderbox and a difficult place to fight a fire. Instead, they have to be more defensive "and try to control the fire from the exterior", said Mr Bryant, a former fire chief in Oklahoma and past president of the International Association of Fire Chiefs. He said: "When a fire gets that well-involved it's very difficult to put enough water on it to cool it to bring it under control." And while there is a lot of water right next door at the Seine River, getting it to the right place is the problem, he said. "There are just not enough resources in terms of fire apparatus, hoses, to get that much water on a fire that's that large." US president Donald Trump's armchair-firefighter suggestion that tanker jets should be used to dump water from above on Notre Dame might have done more harm than good. That cathedral faces fire inspections every two years, but Washington firefighters stop by more often to learn about the church's unique architecture and the terminology involved - so, for example, they will know where to go if there is a fire in the nave, or main area of the church. Jim Shepherd, the cathedral's director of preservation and facilities, said: "It's really important for us to make sure that those local firefighters are aware of our building and our kooky medieval names that we use for all the different spaces and that they know where to go." Archbishop Dolan said: "Just as the cross didn't have the last word, neither - for people of faith in France - will this fire have the last word."